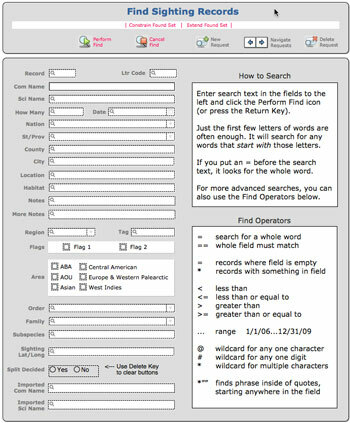 Bird Brain is a world birding database for Macintosh computers. It contains the names, ranges, and taxonomy of all the bird species and subspecies in the world. Bird Brain lets you record and track your bird sightings. It keeps your notes, images, QuickTime movies, and other files with your database. You can enter an unlimited amount of information on each sighting. If you have sightings data in other databases, we can help you move that data into Bird Brain. Click here for more information. Bird Brain makes life lists. With one click, you can see your world life list, a list of only your earliest sighting of each species. And if you have used Bird Brain's powerful search abilities to create a special subset, with that same one click you can make a custom life list based on that subset. Make a life list for 2017, or for your state or your back yard, or for woodpeckers you saw in the UK in January, 2010. You have an unlimited power to create custom life lists. Latest world bird list — Bird Brain 7.3 reference birds data conform to the Clements Checklist of Birds of the World, updated 2018 by Cornell Lab of Ornithology. The reference database contains all the current Clements species, subspecies, and range information. The full list can be downloaded here. For birds of North America, the Clements list seems to rely heavily on the American Ornithologists Union Checklist. However, many sources are consulted. There will always be discrepancies as scientists continue to work out the relationships between species. Older books or books from a particular author will differ from the Clements list. However, when taxonomic adjustments become necessary, or when new birds are discovered or reclassified, if the changes are accepted by the scientific community, they make their way into Cornell Lab, Clements Checklist, and Bird Brain. Bird Brain creates checklists, target lists, and wish lists for over 200 nations and any US state or Canadian province. Bird Brain includes the information of which species are found in each nation. Range data is also available both for species and for subspecies. Bird Brain 7.3 checklist data have been updated to reflect the 2018 changes in the ABA and the AOU checklists. Bird Brain also creates ABA and AOU checklists and target lists. When you upgrade to a new version of Bird Brain, the program makes it easy to see, find, and change any of your sightings that may be affected by splits or lumps. 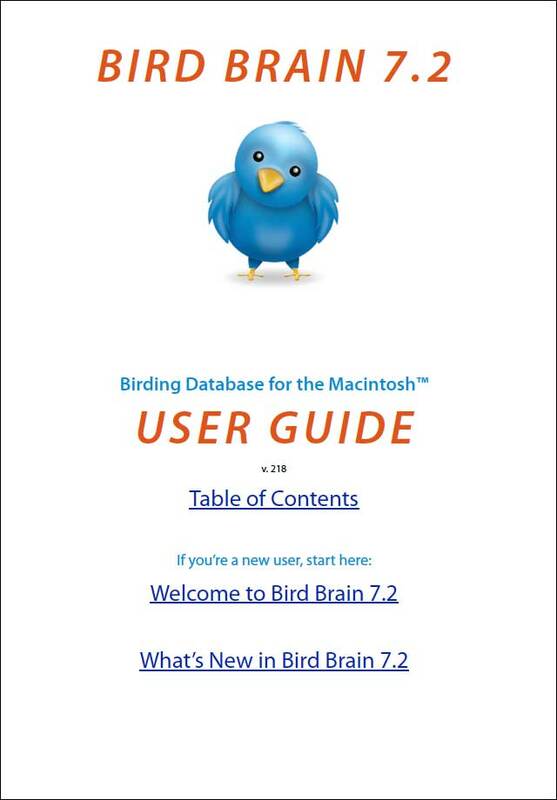 Bird Brain 7.3's reference database reflects the current names and taxonomy. 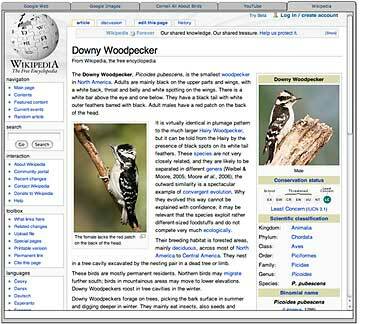 Bird Brain provides one-click access to information on the Internet about virtually every bird species of the world. It may sometimes be helpful to access such information and images when deliberating between alternative identifications for a record you're entering. If you've already entered a record, one click will let you see the page from Google, Cornell All About Birds, YouTube, and Wikipedia relating to that particular species. Typically you will find a wide variety of images of the species in this way. The information available is always dynamic. It's the current, living, constantly evolving ornithology. The Sighting Record window includes three container fields, where you can store photos and movies that you have access to, as well as other files of almost any kind. This is useful when you want to store something with the record of a particular observation. If you enter an image in the Species container field, that image will appear whenever you enter a record again for that species. The other two container fields appear only with the one record in which they are entered. Some users like to keep many photos of one species in Bird Brain. They do so by placing those photos in the Sighting and Media container fields. You can create a slide show of your images. You can also get an overview of your images via the Picture List feature. 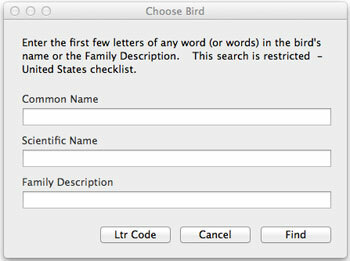 You can limit the list any way you want by using Bird Brain searching features. In the Picture List, you can add, delete, and move photos. This is a great way to manage the photos you have put in Bird Brain, or to locate a particular photo visually. Note that Bird Brain does not come with pictures of birds. However, a few images are included as part of the tutorial records, to serve as examples. You can add delete them if you wish or replace them with your own photos. Or leave them in your Bird Brain program if you want to. Enter a sighting into Bird Brain goes fast. For each record, you need to type only a few letters of the bird's common name (such as a ro), or scientific name (such as t mi), or the common name of the family (such as thrush). Then pick the name off a short list. Bingo! American Robin. To shorten and simplify the list you're picking from, you can limit the list to the species of a single nation. Often just three or four letters shortens the list to one species, and then it is automatically entered into a record immediately. For super-fast entry, there's also the option to enter by species' letter codes, if you happen to be familiar with them. There is also an option to enter by a checklist. Most of the data from a record is automatically carried forward to the next record, so that you don't have to keep entering the nation, state/province, county, city, location, and habitat if you're recording a number of sightings from one place. You can of course replace what was brought forward if you wish to change it. 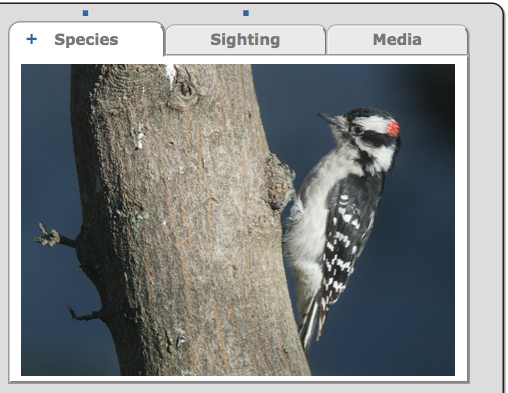 If you report observations to eBird, Bird Brain can make uploading your eBird checklists easy. 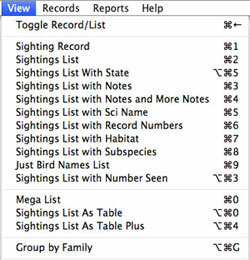 Bird Brain's eBird report creates a file that you can upload directly to eBird, greatly speeding up the entry process. Since you've already entered your sightings once in Bird Brain, there's no reason to have to do it over again. The process is streamlined and fast. You can also import all or any part of your eBird records into Bird Brain and automatically create a record for each sighting. From within eBird you request a download of your submissions, and eBird sends you a file via email. Bird Brain 7.3 has tools that make it easy to choose which eBird records you want to add to your database. This import function can be very useful when you are traveling. You can use eBird's very nice mobile app, which allows you to record sightings in the field and submit them to eBird. When you get home, you can retrieve that data from eBird and import it directly into your Bird Brain database. Bird Brain uses the same Clements checklist of birds as eBird, so your data should interface seamlessly with eBird's. Bird Brain provides access to Google Maps from within Bird Brain. For each sighting, you can easily map and identify the exact spot where that sighting took place. The information is then stored in the record, so that you can pull up the map from the record at any time. You can email the exact spot of the sighting to friends. They can use Google Maps to see just where you saw the bird. This is especially helpful if your sighting was out in a rural area where street addresses don't work. You can map the spot to within a few feet. For each name in your Location field (for example, a certain national park, or your favorite birding patch), you can assign a Google Maps spot. You can use this Location Lat-Long data when submitting an eBird checklist report. 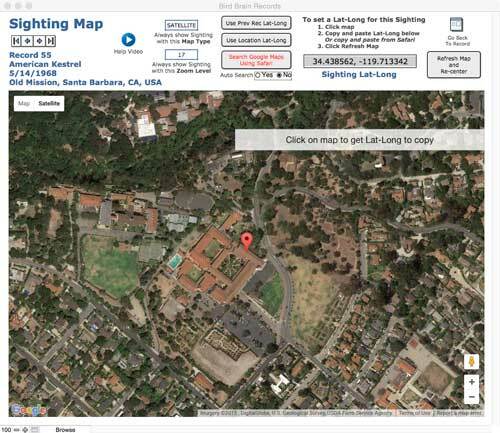 This will save you from having to go separately into eBird's website and map the location. Bird Brain indicates that a sighting is one of your world life list records. It displays a blue asterisk by the Record number field for each such record. Also, on lists, the common names of world life list records appear in blue. There is a option that lets you turn this feature on or off. The Sighting Record view shows all of the information about a particular record, with many fields in it. It has container fields that can store up to three images or other files. It also has tab areas, with each tab displaying different information. The first two tabs are for fields notes, Notes and More Notes. Both Notes fields can handle up to one billion characters of text. 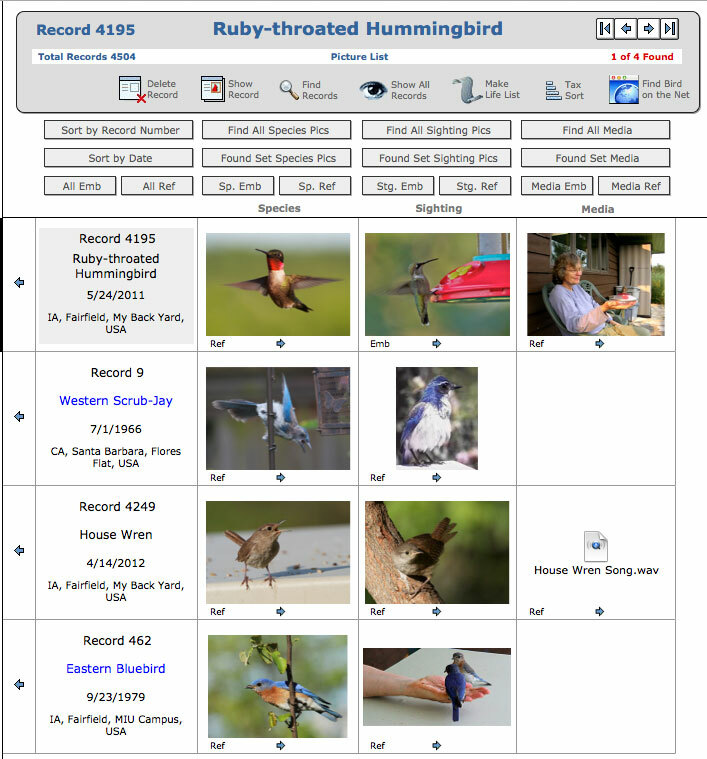 The third tab, Range and Subspecies, shows the range information for the record's species, along with all the ranges for each subspecies. The fourth tab, Auxiliary Info, provides the species' taxonomy and shows which ABA region and ABA areas the species is found in. And, if you have imported data from a previous version of Bird Brain or a different database, the imported names are also displayed. In the fifth tab, Splits, shows the any species splits relating to this species and lets you click to choose the one you want. Every record in your database has a large of number of fields associated with it. In a database like Bird Brain, there are more fields than will fit comfortably on a list report, which displays many records on one page. To handle this, Bird Brain gives you a choice of many different Views. Each View displays certain information and omits other. They can be ordered alphabetially, chronologically, or by location, simply by clicking the head of the appropriate column. To put a list in taxonomic order, it's as easy as clicking a Tax Sort button. All lists can be restricted to include only the sightings that you choose. You can restrict records to those from a date range, from a nation, state, county, location, habitat, region, area, or any combination of field parameters. 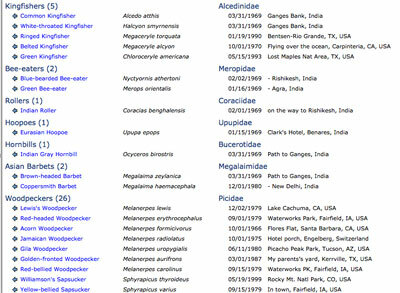 For any selection of records, you can create a life list, showing only the earliest-dated instance of each species in the selection. There is also a list, Group by Family, that sorts your records into taxonomic order and lists the species under headings for their family groups. All of these views can be printed out or exported to an Excel spreadsheet. In case you don't find exactly the list format you are looking for, you can open the Mega List, which contains all the fields. Although the Mega List is far too wide to print, you can save it as an Excel document, from which you can select and customize the data any way you wish. There are also two table views, which let you re-order the columns and alter their widths. This is an efficient way to create special reports that suit your purposes. Bird Brain receives high praise from users for its well written, user-friendly manual. There are lots of screen shots to keep you oriented. It's a PDF document, designed both to be read online and to print out as a book. The User Guide is always accessible from within Bird Brain. There's also a Bird Brain Quick Start Tutorial, which provides the most esssential info on how to start using Bird Brain right away. Bird Brain 7.3 is made in FileMaker Pro and incorporates FileMaker's many powerful features, such as the ability to make any kind of selection of your records that you can imagine. FileMaker is owned by Apple and is one of the most widely used databases in the world. However, you do not need to own FileMaker in order to use Bird Brain. Bird Brain is self contained. Check to see if your Macintosh computer meets the Bird Brain 7.3 minimum system requirements. To see your Mac's system version number, processor, and RAM memory, choose About This Mac from the Apple menu on your computer. 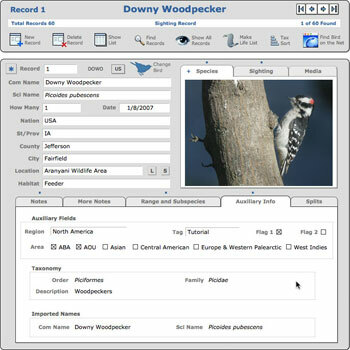 We have helped many customers import data from other birding databases. We convert the data for you and send you a file that you can import into Bird Brain with a simple menu choice. We usually charge a small fee for this service. Please feel free to call us ( 800-779-7256 or 641-472-7256) for more information. Transferring records from AviSys to Bird Brain? Make a Sighting Record Listing of ALL your records. Name the file whatever you want. The file type should be CSV. If you have a big file with many records, you can transfer the file to us here. Or if it's a small file, you can email us an attachment. Can I convert records from other programs to Bird Brain? Please email us a sample of your exported data as a spreadsheet. A tab- or comma-delimited text file or an Excel worksheet would be great. Please include field names, as column headings, so we know what the data means. We'll take a look at your data and see if we can format it for Bird Brain. No charge for us to look at your data. If we can do a conversion, we'll let you know, and we'll let you know how much it would cost. Then you can decide whether you wish to ask us to do the conversion for you.